A new patient came to see us at the Cuyahoga Falls Veterinary Clinic a while back. To protect her identity, we’ll call her Fluffy. 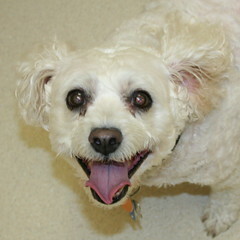 She is an older Bichon Frise, and her owner complained of monthly urinary tract infections going back many months. Blood has been found in her urine on occasion, and she was urinating very frequently, often having accidents in the house. 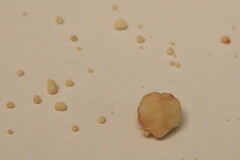 A stone was removed from her bladder several years ago. Radiographs were taken a few months prior to her first visit with us and another stone was found. No treatment was recommended to the owner at the time. A variety of antibiotics had been given on many occasions with mixed results… sometimes her symptoms improved for a time, other times there was no improvement. 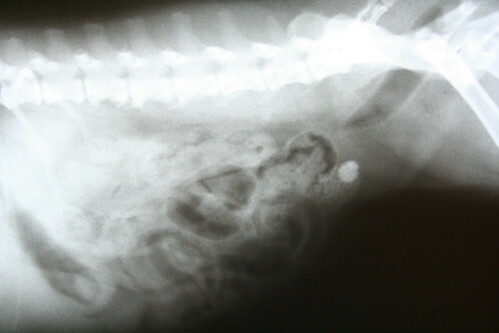 Fluffy’s case hi-lites the topics of bladder infection and of bladder stones. For starters, the only way to diagnose a bladder infection is with a positive urine culture. If a dog’s or cat’s urinary symptoms respond well to antibiotics this does not mean that an infection was definitely present. Many abnormal bladder conditions will respond positively to antibiotics. If a pet struggles with abnormal urinary symptoms with any degree or regularity, the urine ought to be cultured. Secondly, sometimes bladder infections lead to the formation of crystals and stones while other times the presence of crystals and stones induces inflammation of the bladder that makes it easier for infection to set in. It really can be a “Chicken And The Egg” scenario. Getting back to Fluffy, her urine was cultured and a radiograph was taken of her belly to see whether or not she had passed her stone. She had one large stone and many, many smaller stones at the time of examination. Additionally, her culture was positive for Staphylococcus haemolyticus. The lab report also showed that the bacteria was resistant to most of the first-choice antibiotics that she had received off and on over the past several years. Fluffy’s history suggested that she formed crystals first and then developed infection, but we were not certain about this, and because her problems limited her quality-of-life (and her owner’s quality-of-life! ), they both needed to be addressed. In order to provide her with long-term comfort, her stones were surgically removed, she was treated with an antibiotic that the lab report showed would resolve the infection, and she was started on a prescription diet that will reduce the tendency of her urine to form crystals. Because Fluffy’s urinary symptoms came and went seemingly by the month, we cannot simply rely on her behavior to know that her infection has been cured. A follow-up culture is necessary to determine that the bladder is infection-free. Without crystals, there will be no stones. And without bacteria, there will be no infection. Fluffy will be pain free! Sometimes pursuing a number of tests at once seems daunting. Sometimes pet-owners prefer to treat the symptoms rather than take on the cost of diagnostics. But as Fluffy’s case demonstrates, electing for diagnostics, getting a definitive diagnosis and addressing the condition specifically turned out to be less costly than the repeated symptomatic treatment month after month over a couple of years that she had been receiving. When all is said and done, we’re interested in the plan that will bring the best quality-of-life for your pet and for you. For Fluffy, she’ll be able to live with a comfortable bladder, and that makes us happy. Give us a call at 330-929-3223 to set up an appointment for your four-legged friend and we’ll help you all enjoy the quality-of-life that each of you deserve. Comment on "Spotlight on Urinary Health: Accidents, Infections & Stones"